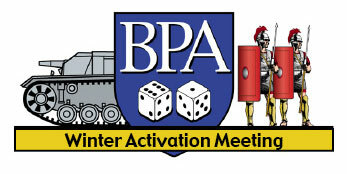 From Thurs., Jan. 24, through Sun., Jan. 27, 2013, in Timonium, MD, the BPA will host its annual Winter Activation Meeting on the weekend before the Super Bowl. The focus of this four-day event is to provide a gaming mini-convention for the two-player historical "card-driven" boardgaming community. Three tournaments from 2012 will be returning: Twilight Struggle, Hannibal: Rome vs. Carthage and Washington’s War. In addition, Labyrinth will be offered for the first time as the fourth tournament (replacing Combat Commander). These are the only official tournaments that will be run, all as fully sanctioned BPA tournaments with full laurels to be won, and all will have a set schedule (see below). However, there may be informal tournaments run during the weekend (such as the semi-annual March Madness tourney). Participants are also welcome to open game to their heart’s content, so bring your other CDG titles along. Once again we will have our deluxe WAM-themed tee-shirts available for purchase. Thursday will be devoted to “open” first rounds and nothing will be formally scheduled on that day. Upon arrival, attendees may seek out the GMs and have a Round 1 opponent assigned for any tournament (this would NOT be a Mulligan). On Friday and Saturday each of the tournaments will have formal rounds scheduled (including Round 1). Anybody who played a Round 1 game on Thursday would be exempted from playing in the scheduled Round 1 for that tournament. While it will be possible to play in all four tournaments, scheduling conflicts would probably preclude one person from being able to win all four tournaments, so everyone should plan their schedules accordingly. Any player who has ambitions of winning more than one tournament would be well advised to play at least two Round 1 games on Thursday, as the following schedules are constructed under the assumption that players will do that. Also, please note that there will be some flexibility to the scheduling as circumstances allow, particularly for the night rounds (2 and 4). Swiss Open/Five Rounds: Each event will run for four or five rounds (allowing drop-ins for any round). If you want a top finish, you must participate in all rounds of an event. Pairings in the First Round will be random or players will be matched in the order in which they sign in with the GM. After the first round, players with similar records will be paired in each successive round (much like a single elimination tournament as long as you win). Twilight Struggle (GM ­ T. Coleman): We will use the Second Edition rules/cards and the clarifications current on the GMT Games website as well as Boardgamegeek and Consimworld websites. Players will bid IPs (to be given to the US at the start) to play the USSR. To avoid ties, at final scoring the player who holds the China Card will only be awarded a ½ point. Use of the Deluxe game rules will be optional if both players agree. Hannibal: Rome v. Carthage (GM ­ R. MacInnis): Either the Avalon Hill or Valley Games versions may be played (Second Edition rules for AH). Players will bid PC markers for sides. A 9-9 tie after nine turns will count as a victory for Carthage. Labyrinth (GM P. Gaberson): We will play the Let's Roll scenario. Initially all games will be single deck. Depending on how play progresses later round games may optionally go to two decks (if both players agree). To keep play time down no three deck games will be allowed. Side choice in early rounds will be by random die roll. In later rounds the GM may assign sides to assure everyone plays both sides approximately equally. The latest living rules from the GMT web site will be used if any questions arise. Washington's War (GM ­ K. Wixson): Sides will be random in Rounds 1 and 5. In Rounds 2-4 the GM will pair players such that everyone plays both sides an even number of times through the first four rounds. What happens in case of a BIG turnout? We will be contracting for a fixed amount of table space. Consequently, we are emphasizing pre-registration in order to be able to provide enough table space. The top finisher in each official tournament will receive an official BPA plaque. The plaques will not be available at WAM, however, as we are now ordering them after the fact in an effort to control costs. All WAM plaques will be available for pick up at the 2013 WBC or will be mailed after WBC for those unavailable to attend. Additionally, the top six places in each will receive laurels. All of the rules and regulations for attending the annual WBC convention will also be in effect at WAM. These games were selected due to interest expressed in the general gaming community and those that we enjoy hosting and playing. Obviously, participants, as always, will need to make choices. After losing a game, some players will choose to move to a new event, while others will continue to play for the experience. Of course, winning an event championship is likely to require wins in every round. Face it, we are experiencing symptoms of withdrawal from our wonderful experience at WBC in August. We realize that there are many events in the winter and spring. We have no desire to detract from them. However, we wanted to run something over the winter close to Baltimore's major airport (for ease of travel for both drivers and fliers) that would appeal to the WBC "card-shark" gang without the distraction of competing events. Late January during the lull before the Super Bowl seems to fit the bill. All participants are STRONGLY encouraged to pre-register ($50 for all four days or $15 per day if received by Jan. 11); those not pre-registering will pay $60 for all four days or $20 per day at the door regardless of BPA affiliation. The price jump reflects our desire to strongly encourage pre-registration. Please send a pre-registration check, payable to BPA, 7766 Valley View Court, Hickory, NC 28602 or make payment via Paypal to paypal@boardgamers.org. We will post the names of pre-registrants on the WAM web site. LODGING: BPA has obtained a very favorable group room rate of $99 per night plus applicable state and local taxes (currently 13%). To obtain this rate you must identify your affiliation with the BPA's WAM gaming conference and make your reservation before Jan. 11, 2013 (or when our roomblock sells out, whichever occurs first) at 410-560-1000 weekdays between 8 AM and 7 PM EST. After Jan. 11, reservations will be accepted on a space or rate available basis. Alternately, you may contact Holiday Inn, 9615 Deereco Rd, Timonium, MD 21093. Be sure to identify your affiliation with our group—both to get the best rate for yourself and to credit our group with your stay. Room options include one king or two queen size beds. King rate is an additional $10/night. Suites are available for $149. Chili's restaurant is attached to the hotel and open for lunch and dinner. Light Rail: HOURS OF OPERATION are Monday through Friday from 6 AM - 11 PM; Saturday from 7 AM to 11 PM; Sunday and Holidays from 11 AM to 7 PM.) Direct Access from BWI Light Rail station - Get off at the Timonium station stop. Upon exiting the station walk/turn right down Deereco Road (towards Padonia Road). The Holiday Inn is about 1/2 mile ahead on the left. Driving: From North and South Via interstate I-83: Take I-83 to Exit #17- Padonia Road. Go East on Padonia Road towards Timonium. Turn right onto Padonia Road off the Exit Ramp and stay in the Right Lane. Make a Right at the first traffic light. This is Deereco Road. The Holiday Inn is the first entrance on the right. If the front lot is full, try the large parking lot in back of the Hotel. If both hotel lots are full, additional parking is available at next two buildings past the hotel.